My twenty-first ground of 2017 was on Monday 28th August at Privett Park in Gosport, Hampshire. 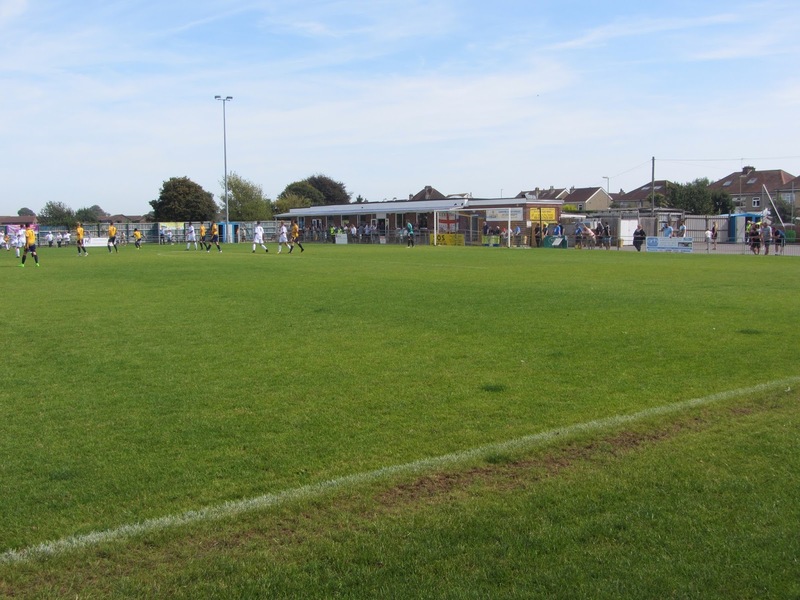 The match was Gosport Borough vs. Basingstoke Town in the Southern League Premier Division. 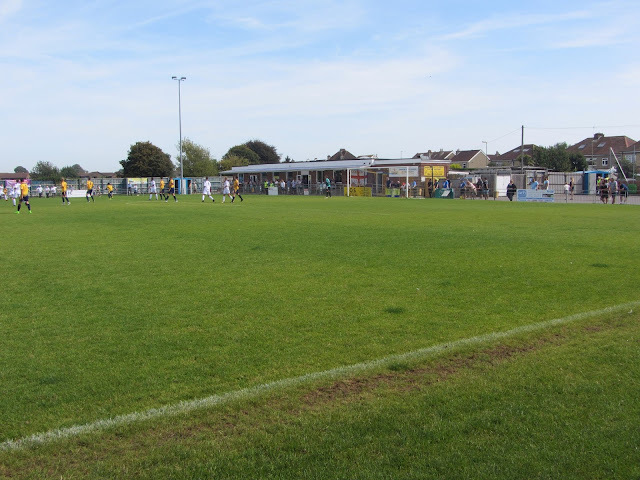 The football ground is part of the wider Privett Park in Gosport. This park is an area of green space surrounded by housing estates on all sides. In addition to the football ground there are four more full-size pitches, a cricket pitch, a concrete court and a playground. Gosport is the largest town in the UK not served by a railway station. The nearest is Portsmouth Harbour station though this does require an additional connection via the Gosport ferry to cross the channel between the two settlements. The venue was opened in 1937 hosting Gosport FC initially before Gosport Borough were formed in 1944. The main stand is on the western side of the ground and consists of 7 rows of wooden benches. The middle section of the stand has plastic seats attached to these wooden benches. This middle area includes a separate section carved out for officials, a press box at the back of the stand and the players tunnel in the middle of the stand. The stand has a total of 4 supporting beams helping to support the roof so there are a number of restricted view seats as a result. In front of this stand there is a flat concrete area with the two dugouts in front of this. East of the main stand there is a long single-storey building which has a food outlet, toilets and a club shop. West of the main stand there are two other buildings which were both closed during my visit. The eastern side of the ground has the Harry Mizen Stand which runs about half the length of the field. This modern all-seater stand has a TV gantry on top of it and the rest of the eastern side is uncovered standing. The southern end has a large clubhouse called 'Inn Off The Post'. This clubhouse has a covered standing platform section in front of it and a flat area with picnic benches adjacent to it in the south-east corner. To the west of the southern goal there is a large flat concrete section with a dozen car park spaces. The opposite end of the ground is uncovered standing with a sizeable grass section behind the hard standing area. 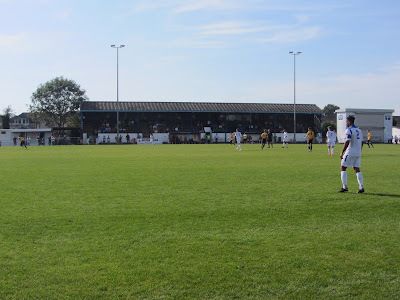 This was once given over to a temporary stand when the side reached the 1st Round of the 2014/15 F.A. Cup. Both sides had experienced poor starts to the league season with Basingstoke having lost three of their opening 4 games and Gosport still looking to pick up their first point. It took all of 60 seconds for the visitors to take the lead when a cross from the right wing was met with a header by Ben Wright which looped over the keeper into top corner. On the quarter-hour mark Basingstoke doubled their lead after a dreadful defensive mix-up between Gosport keeper Matthew Cafer and defender Declan McCarthy saw a long ball over the top left by both of them. Sam Smart reacted quickly to the indecision, flicking the ball up and heading into the empty goal from 12 yards. The early going was all Basingstoke and they came close to extending their lead with half an hour gone when some nice link-up play saw Ben Wright's great volley from the edge of the area skim the top of the crossbar. Wright went close again from the edge of the area shortly after but his shot went just wide with the keeper watching. To be fair to Gosport goalie Cafer he made several saves to keep the score down during this period but the resistance only lasted until the 39th minute when Ousman Saidy brought down Sam Smart as he went past him on the left wing. Ben Wright placed his penalty low to keeper's right. Cafer did get a hand to it but it wasn't enough to keep it out. The visitors ran rings round Gosport in the opening 45 minutes and the hosts were fortunate to be only 3-0 down at the break. Any hope Gosport had of keeping it tight in the start of the second period were dashed when Basingstoke went 4-0 up barely a minute after the restart. Sam Smart was given the ball on the right wing and was allowed all the time in the world to cut inside and shoot across goal into the bottom corner of the net. The home side had their first chance of the game in the 54th minute when Tyrell Mitford was played in on the right wing and the visiting goalie pushed his shot onto the bar. Shortly after this Tyler Roach took a shot from the left wing requiring the Basingstoke shotstopper to get down well to stop the ball going in the inside post. This decent ten minute spell for Gosport was as good as it got and they found themselves 5-0 down in the 69th minute. The hosts were sleeping when a quickly taken free-kick was played to Ashleigh Artwell on the left wing and he crossed for Jack McKnight to smash into an empty net from a couple of yards out. It didn't take long for goals six and seven to arrive. In the 75th minute Connor Davis did well on the right wing and crossed for Jack McKnight to tap in. However before it got to him Gosport defender Ed Sanders stuck out a leg and ended up flicking it up with his heel, with the ball looping into the bottom corner. From the kick-off Basingstoke nicked the ball and forced a corner. The corner found Dan Collier who chested it down and smashed the ball through the keeper's legs from 6 yards out. The visitors weren't done yet and on the stroke of 90 minutes added an eighth. Good work by Marcus Johnson-Schuster down right wing allowed him to cross for Jack McKnight who shot well into the corner past a sea of players. In injury time the away side almost grabbed a ninth goal when a long ball put Connor Davis in the clear but his first touch was smothered by the keeper preventing an otherwise certain goal. After this the whistle went putting Gosport out of their misery until the next game at least.